On Wednesday Nov. 29, as part of VA’s Veterans and Military Families Month, VA secretary Dr. David Shulkin and deputy secretary Thomas Bowman spoke to more than 200 attendees at the White House Veterans Affairs Conference for state, local and tribal leaders. 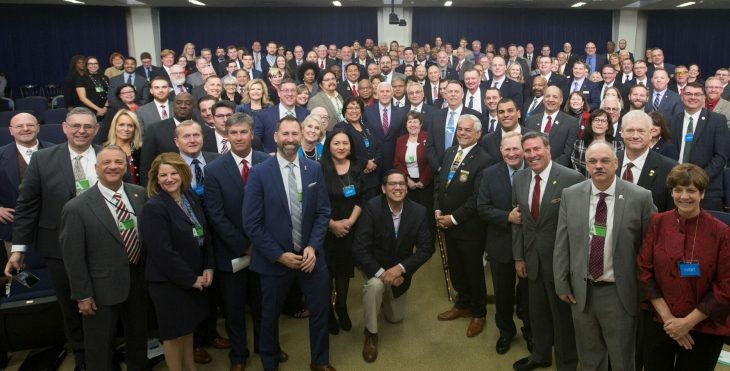 The conference, organized by the White House Office of Intergovernmental Affairs, provided an opportunity to build relationships between the administration, state, local, and tribal leaders who are leading efforts to better serve Veterans. Attendees included state directors of Veterans affairs, county Veterans leaders, tribal government officials, directors of state Veterans homes, state legislators who serve on Veterans affairs committees, and workforce leaders who assist in helping Veterans find employment after they leave military service. Shulkin addressed the group, detailing his five priorities including greater choice for Veterans, modernizing VA’s systems, focusing VA’s resources, improving timeliness of care and suicide prevention. He also discussed some of the challenges that VA faces and what has been done to address those challenges during his first year as secretary. Following his remarks, Shulkin joined Bowman on stage for an open discussion where attendees provided feedback based on their experiences with VA in their respective communities. In addition to Shulkin, guests heard from U.S. Department of Labor secretary Alex Acosta, Health and Human Services acting secretary Eric Hargan, senior White House staff, and were treated to a special appearance from Vice President Mike Pence. About the author: Christopher Syrek is VA’s executive director of state and local government affairs. Just seems when one VA leader leaves he takes all of his “ideas” with him and we have to start fresh with a new head of the VA. This happens too often. And everything remains same ole same. First I do understand there are veteran that need valet parking. I know I am not alone on this situation that has occurred in West Palm Beach Medical Center (WPB). I and many other veteran drive a many miles to get the WPB and have to deal with traffic which in its self raises my blood pressure. Recently they have taken a large parking lot and make it valet parking only. The last 2 times I had an appointment I drove around an average of 25 minutes looking for parking while this valet area was ½ full at 9am. Let alone just making my window of 15 minutes before my appoint was canceled. I now have to add at less 30 minutes to my 50 minutes travel time in hope I make my 15 minutes window. Can someone come up with a better way?